Pleasant excitement of kids, parents’ smiles and happy teachers with tons of flowers in their hands – all this creates a festive atmosphere in the streets on the Knowledge Day. Unlike many countries - the former republics of the Soviet Union – Azerbaijan celebrates the Day of Knowledge on September 15. This is the day when the new academic year begins in the country and over 1 million of Azerbaijani children head back to school after a three-month summer break. Every year, the first day of the school year is widely celebrated across the country with numerous solemn and festive events dedicated to the Day of Knowledge - an important day for students, teachers and parents. But, this day is especially significant for the first-grade students, whose school life will begin with the sound of the first bell. 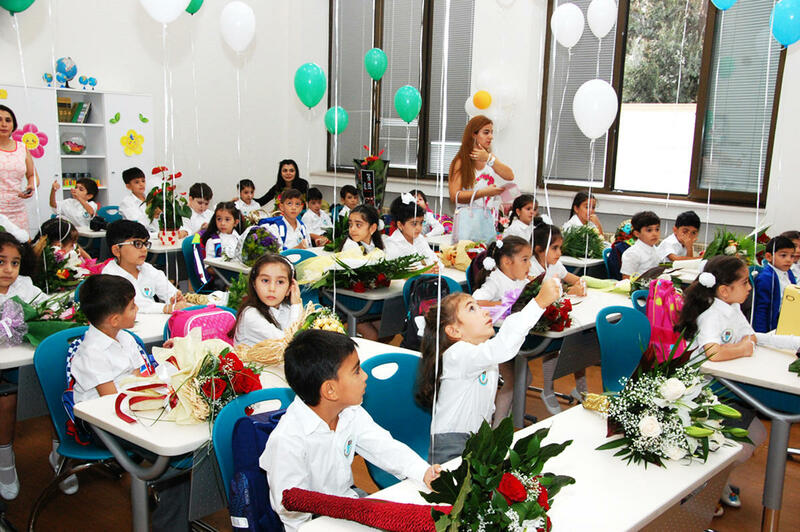 In the new school year, the total number of schoolchildren in Azerbaijan will be 1.5 million, of which about 165,780 students will go to the first grade. Since September 15 falls on Saturday this year, for schools with 5-day working schedule, meetings of schoolchildren, especially first-graders, with teachers, familiarization with classes and schedules, information on duty, etc. are planned for this day. The classes will start on Monday, September 17. For schools with 6-day working schedule the first school day is set as usual on Saturday, September 15. Education in Azerbaijan is free and compulsory for all children between the ages of 6 and 15. It is comprised of three levels -- primary, general secondary, and full secondary education. Recently, a number of new and renovated schools equipped based on the most modern standards has been opened in the country. Azerbaijani school students have to wear a school uniform according to the Education Ministry's decision. For many children, discovering every new thing in the world is a step forward in a long way. But the most touching milestone for each first-grader is when they encounter their first schoolteacher. September 15 is the beginning of new challenges and victories, difficulties and achievements, sorrows and joys. We wish all the schoolchildren and students good luck in the coming academic year!